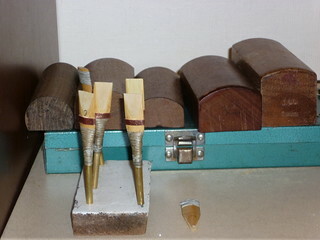 I had not good luck with the correct reed working for the "D" Rogge bass reg as been using the set as a set 3/4 because I have the detachable bass reg. I have made one D bass reed 6 June 2013 and a few days ago I had a look at my reed as was leaking air so unbound reed and sanded the inside on the 82 mm block rebound reed and added new copper bridle. 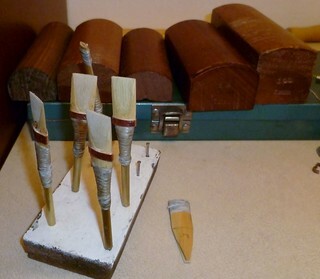 Dia for my D Bass reed I made from 6 June 2013. This reed sounded great when tested when blown though the reg by mouth. I have now today connected the bass reg to main stock. 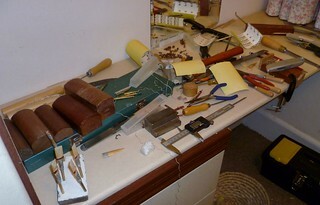 I have tested bass reg reed with chanter/tuner and reed in reed seat all the way in but reed playing flat. How do I sharpen reed to raise the pitch. Do I use shorter staple or insert staple further in tails. You may be a bit wide in the head, resulting in too low a pitch. I would suggest a 13.0mm wide head and a 9/64" staple i.d.. A staple blank of 0.020" copper 0.500" wide will roll a tubing staple around a 9/64" mandrel. I find the available tubing too large or too small in dia. for the job. The resulting staple is mid-way between the two tubing diameters. Better to have a tuned staple than to try to do it all with the head. My Rogge pipes use hobby tubing for staple. So can you get hobbing tubing in size 9/64 inches = 3.571875 id but what is the od diameter. I have used 5mm od copper tubing for my chanter reeds and this tubing has an internal diameter close to 3.5mm. I obtained a 1 metre length of this tubing from ebay. I found hobby round brass tubing online. od 5/32" = 3.960mm so if the wall thickness of 0.014 would that make the id 0.142" = 3.6068mm. If I calculated right this tubing should work. Hi Fergus, the 5/32" o.d. tubing with a .014 wall is approx 1/8" i.d. You have to subtract the .014 wall twice so it would come to .128" i.d. Which would accept the next size down as these are made to telescope together and have a wee bit of clearance to slide smoothly. I buy 5/32" and 3/16" K and S brass tubing from Macc Model Engineers Supplies Ltd on ebay. I see they now sell 4mm od Brass K and S Tubing 12" THIN WALL that is 3.5mm id with a wall thickness of 0.225mm. Great I found the size I need. 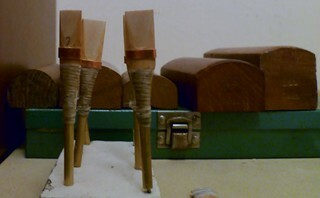 Few photos of some D bass reg reeds for my D Andreas Rogge full set I started making in November 2014. 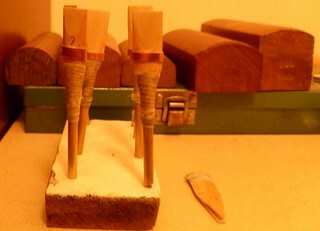 Will test reeds in Bass reg later this week.